St Joseph, French Gothic Sculptor, c 1240. St Joseph, Rogier van der Weyden, 1445. The Donor with St. Peter and St. Joseph, Hieronymus Bosch, 1510. St Joseph with the Infant Jesus, Guido Reni, c 1635. The Dream of St Joseph, Georges de la Tour, 1640. Web Gallery of Art. Joseph Recounting His Dreams, Rembrandt van Rijn, early 1640's. National Gallery of Art. The Vision of St. Joseph, Philippe deChampaigne, 1642-43. National Gallery, London. The Dream of St Joseph, Rembrandt, 1650-55. Joseph with Infant Christ, Murillo, 1665-1666. St Joseph Leading the Christ Child, Bartolome Esteban Murillo, 1670-75. State Hermitage Museum. Saint Joseph Carving, Stanley Mazur, c 1938. National Gallery of Art. Joseph with Baby Jesus, Louis S Glanzman. Dream of Joseph, Noel Series, Brian Whelan, contemporary. 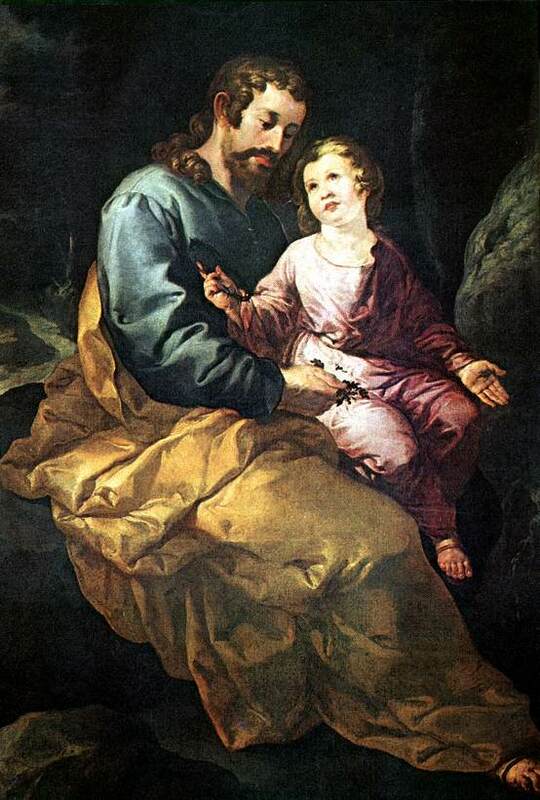 St Joseph and the Child, Francisco de Herrera the Elder.